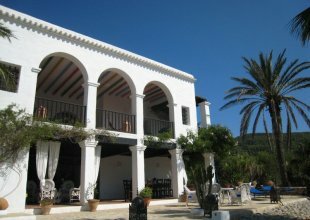 Villa Sa Claro is a luxuriously decorated minimalist villa, located close to the village of San Josep on the south-west part of Ibiza. Situated on an isolated plot of 22,500sqm, this property offers total privacy with no closely located neighbours. The villa also offers the most amazing views over San Antonio Bay with its dramatic sunsets. 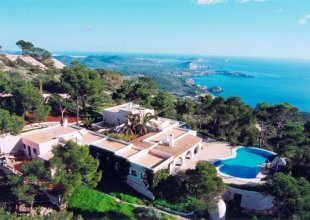 Most of the south and south-west beaches are located within a 10 minute drive of the villa including Cala Conta, Es Cubells and Cala Jondal with the famous Blue Marlin beach club. The airport is also just a 10 minute drive away. The villa comprises of three separate buildings which can be rented separately or as a whole sleeping up to 24 people. The stunning Upper House provides luxury accommodation for up to 8 people with a large living-dining room on the ground floor opening up on to the spectacular pool terrace. There is also a lovely fully equipped kitchen and separate guest cloakroom. There are 3 bedroom suites located on the ground floor, all with queen sized beds and a complete bathroom. The first floor is entirely dedicated to the fantastic Master Suite which extends to 80sqm with a queen size bed, dressing room and a large bathroom with 2m x 2m designer Jacuzzi. Two sun terraces are located off the first floor where you can enjoy the amazing views of the sea and sunsets. There is a wide open terrace at the front of the villa spanning 900sqm complete with a barbecue and gas grill, making this the perfect entertaining and al fresco living space. There are also 2 swimming pools – with an adult pool of 18m x 3m and a kids pool of 5m x 5m, an outdoor Jacuzzi and waterfall with 5 small pools and 5 spa jets. The villa also has Mediterranean, Zen and Cactus gardens.